You can understand why some Chelsea fans let out a huge sigh of relief following the Champions League semi-final draw. After all, the Blues had just avoided current European champions Bayern Munich and Real Madrid - the continent's most successful club - in the last four. Atletico Madrid are competing in their first Champions League/European Cup semi-final since 1974. 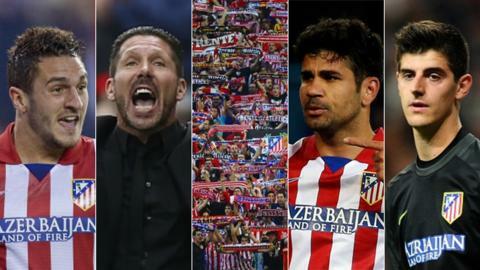 That paired Jose Mourinho's men with Atletico Madrid, a club which has a lack of recent pedigree in Europe's top competition. But any Blues supporters thinking they have got the "easy" draw should think again. Under the guidance of ex-Argentina midfielder Diego Simeone, Atletico are attempting to complete a La Liga and Champions League double - an unthinkable prospect to most Spanish football fans at the start of the season. Now they are just seven games away from achieving that dream - and here are five reasons why Chelsea should be wary of Los Rojiblancos. Never has a loan player been the subject of such fevered debate ahead of a crucial Champions League tie. If reports are to be believed, Thibaut Courtois's selection hinges on delicate political posturing between Chelsea and Atletico. Some say Atletico want to keep relations cordial with Chelsea in the hope of securing Courtois's services for another year, with Spanish newspaper Marca claiming it means they will not play the Belgian. Others believe the English club also want to maintain niceties, because they have set their sights on a summer move for Atletico striker Diego Costa, so are not demanding Courtois cannot line up against them. But the man himself says he can play which appears to put an end to the debate. Ever since Chelsea and Atletico were drawn against each other, the future of young Belgium goalkeeper Thibaut Courtois - both immediate and long-term - has been the major talking point of the tie. The on-loan Atletico stopper signed for Chelsea in a £8m deal in 2011 before being immediately loaned to the Spanish side without making a single appearance for the Blues. Now the 21-year-old's selection is as vital to Atletico's success as it is to Chelsea's detriment. He has been a key figure in Los Rojiblancos's ascension to the La Liga summit, which has largely relied on their stingy defence. Simeone's men boast the best defensive record in the Spanish top-flight, having conceded just 22 goals at a rate of 0.7 per game, while Courtois has kept 18 clean sheets in his 33 top-flight matches - more than any other La Liga goalkeeper. Thibaut Courtois has saved 82.1% of shots faced in the Champions League this season; Petr Cech has saved 76.7%. For a man standing at 6ft 6in tall, it is not surprising that he commands his penalty area with authority and has the strength to stand up to any aerial threat. Equally, he possesses incredible agility and rapid reactions to mark him out as a superb shot-stopper. But perhaps most impressive is his cool temperament. Nothing appears to faze the Belgian, whose rapid rise from 14-year-old defender at Genk to one of the world's greatest goalkeeping talents borders on the remarkable. "I respond well to pressure. It makes me play even better," he says. And that could spell trouble for Chelsea. The word used by Atletico coach Diego Simeone to describe the attitude he wants from his team is "intense", and that's a good description for their relentless, utterly committed approach. The opening 20 minutes of the quarter-final home leg against Barcelona can be studied as an object lesson of Atletico's style. Simeone's men simply swarmed all over their visitors, giving them absolutely no time to enjoy comfortable possession and playing at a breakneck pace. In that respect, Atletico's style is very different from most Spanish teams. Rather than prizing possession, Simeone demands they control space by retaining a fiercely disciplined team shape and moving together as a finely honed unit. However, although Atletico like to get the ball forward into danger zones as quickly as possible, there is nothing 'long ball' about their approach, as they manage to combine directness with precision thanks to Simeone's meticulous attention to detail and their unshakeably strong team structure. Diego Costa's face was not the only one bearing a pained expression after his sickening collision with the Getafe post recently. His Atletico team-mates turned pale as their concerned coach Simeone grimaced on the touchline, partly because they had seen the gruesome gash just below the Spain striker's left knee and partly because they feared their top scorer had suffered a season-ending injury which would hamper their La Liga and Champions League ambitions. While Courtois and his defensive cohorts lay a solid platform at the back, the burly Costa is the man who regularly wins them matches with his goals. And, although they managed to sneak past quarter-final opponents Barcelona in his absence, Los Rojiblancos did not want to face Chelsea without their talisman. Remarkably, the nasty wound sustained as he sealed a vital league win at Madrid neighbours Getafe was nothing more than superficial and the 25-year-old is expected to lead the line at the Vicente Calderon on Tuesday. Diego Costa has scored seven goals in six Champions League games, plus one assist, this season. Strong, aggressive and explosive are three of the adjectives commonly used to describe the Brazil-born player who was at the centre of an international tug-of-war between the country of his birth and his now adopted nation. "When I saw him in training, I wanted to die," Simeone said earlier this season. "He was unstoppable. Diego Costa transmits a strength which has a contagious effect on the rest of the group. "He gets better every day. I love watching the diagonal runs he makes and his directness towards the opposing goal." But he also has a tendency to lose his temper. La Liga defenders often like to dish out the rough treatment in a bid to provoke a reaction - and you can bet Chelsea skipper John Terry, a defender not adverse to antagonising opponents, is well aware of that. "He gives everything, but he has to learn to control himself," added Simeone. Costa could have moved to Liverpool last summer - and it is unlikely an Atletico side without him would be challenging for their surprise double. He has scored 27 goals in La Liga, with only Real Madrid's Cristiano Ronaldo sitting above him in the scoring chart, while he has scored another seven strikes in the Champions League. But Costa does not only score goals - he scores important ones. Testimony to this is his matchwinner against Real in the Bernabeu, along with tie-defining goals against last-16 Champions League opponents AC Milan and decisive strikes in recent La Liga matches which have kept Atletico's title bid on course. When Barcelona midfield king Xavi describes a player from a rival team as the heir to his throne as Spain's dictator of play then you had better take note. The man earmarked as his potential successor for the reigning world and European champions? Atletico's Koke. The 22-year-old has emerged as one of the best Spanish creative midfielders, overtaking Real Madrid's Isco and Athletic Bilbao's Iker Muniain in the thoughts of national boss Vicente Del Bosque. And, like many of his Atletico team-mates, Koke has flourished under the guidance of Simeone. The Madrid-born, Atletico-supporting youth-team product has the ability to play anywhere across the Argentine's midfield, but is usually deployed on the right where he likes to find pockets of space before using his devilish right foot to great effect. Perfectly-weighted short passes, incisive throughballs from deep or teasing crosses which are nightmare to defend - he has the full range among his repertoire. And there is substance to this style, illustrated by the fact that he has created more goals than any other player in La Liga this season. "Koke is an extraordinary footballer," Xavi said. "He has everything: talent, physical ability, he is a footballer of the present and the future. "He has been marked out as the conductor of Spain's orchestra for the next 10 years." Chelsea's superstars have experienced plenty of hostile environments in the past, but little will have been able to prepare them for the noise they will encounter at Atletico's red-hot Vicente Calderon stadium. Atletico fans are utterly buoyant and determined to play their part to help their team's fairy-tale season enjoy a happy end by creating an intimidating wall of noise. Atletico have not lost a La Liga match at the Vicente Calderon this season, winning 15 and drawing three of their 18 matches. Their only home defeat came in a 2-0 Copa del Rey loss by neighbours Real Madrid. This was particularly evident in the quarter-final against Barcelona. The home fans created a thunderous atmosphere which gave "great positive energy" to the Atletico players, according to Simeone. "This environment is difficult to find in Europe, but it's more common in Argentina," Barca boss Gerardo Martino reflected afterwards. The contribution from the crowd will come in waves: a deceptively quiet few minutes will be shattered by an explosion of noise when the home crowd start to sense that the Rojiblancos are getting on top. When Chelsea enjoy dominant passages of play, they will have to withstand the ear-splitting noise of 50,000 Atletico fans simultaneously screaming and whistling in defiance. And Simeone will do his utmost to ensure the fans are involved. He can often by seen playing the role of cheerleader, turning dramatically towards the stands and frantically raising his arms to request more noise - and those exhortations are never declined.